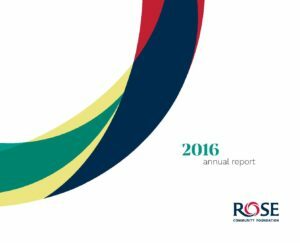 In 2016, Rose Community Foundation’s work was firmly grounded in our values and our strengths as a community foundation. Through our grantmaking, we worked with nonprofit organizations to encourage their evolution, invest in innovation and facilitate collaboration. We also celebrated with programs as they reached maturity and empowered them to listen to those they serve to learn and adapt. Through our own Rose Community Legacy Circle and our endowment cohort program, we continued to provide a strong foundation for our community’s future through philanthropy. We mourned the sudden loss of Sheila Bugdanowitz, our president and CEO of 18 years who was instrumental in who the Foundation is today. You will find stories of our work and a tribute to Sheila in our Annual Report.